I know I know we just had a Sew Day on Saturday for twelve whole hours but guess what - I got to spend a full day hanging out with my quilty friends today at SBAMQG's second event of the year! Two in one week is a record - one I'd repeat anytime. 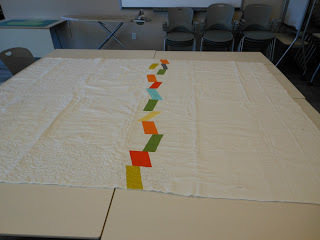 Linking up the Amanda Jean at Crazy Mom Quilts for Finish it Up Friday. It's a finish-ish to share but that's only because I ran out of thread with one little patch to FMQ. Soon I'll be passing this along to the next guild member to do their part, the binding, the sleeve/label... and then it will be mailed off to Austin. 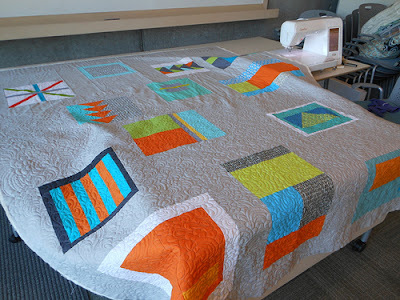 Watching the QuiltCon Charity quilts showing up slowing on flickr and blogs has been really fun. Tina made the most wonderful back and I'm kicking myself for not having taken a picture of it before starting the FMQ while it was all pressed. I think this Little Bits has officially been added to my to do list of things to make next. The back for Driving in Circles took me a really long time to do. 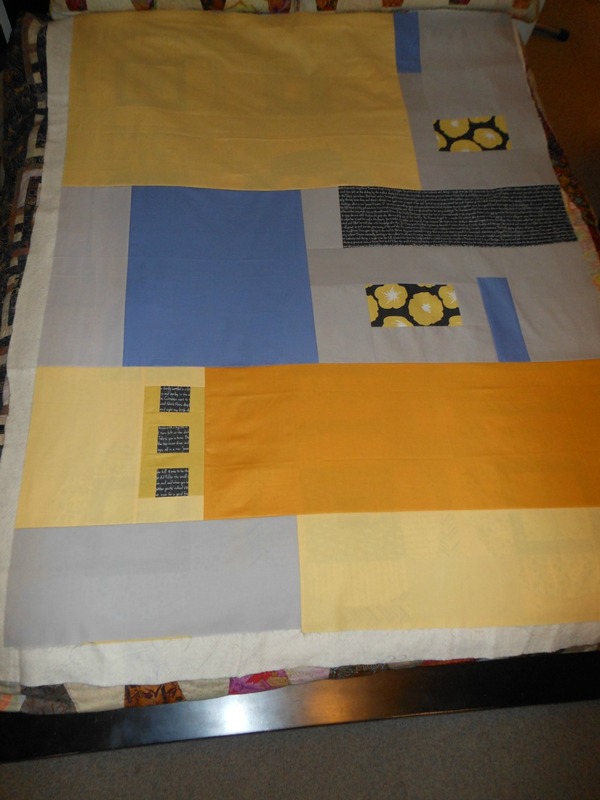 It was a fun improv piecing session so I don't really mind and I'm pleased with the layout. Excuse the color of the goldenrod - the camera is picking up much more orange than it really is. Hope you are finding some finishes of your own. very cool projects here Karen! 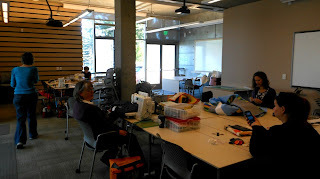 Great to have all that fun sewing time too! The guild is going to owe you a massage after all those hours of FMQing!!! It looks amazing! Wow! You are really fast! Looks great!